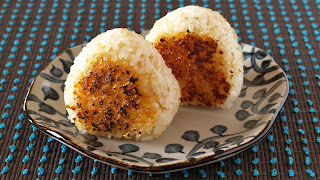 Yaki Onigiri is Grilled Rice Balls. Crispy, smoky and savory on the outside, and soft inside. If you have a BBQ set (grill over charcoal), that would be perfect. 1. Mix A in a small bowl. 2. Mix sesame seeds in the rice (optional) and make 4 rice balls (you can use plastic wrap or wet your hands in water so that the rice won't stick). 3. Heat sesame oil in a frying pan, place the rice balls, cook both sides on a medium-low heat until browned. You can simply brush them with soy sauce or Mentsuyu (concentrated dashi stock) but Miso is distinctive!